DJIA futures for Monday, April 6, were on the decline by 128 points this morning after Thursday's close. The DJIA added 65 points on Thursday, fueled by increased optimism over the U.S. employment situation. On Friday, the markets were closed for Good Friday. However, the U.S. reported weaker-than-expected payroll growth. The nation created its smallest amount of jobs in 15 months. That has raised broader questions of whether the U.S. is experiencing a broader downturn or if the nation just hit a speedbump in March. 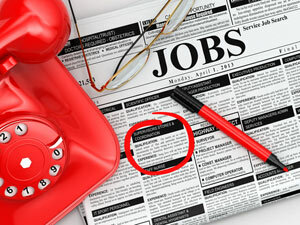 Only 126,000 jobs were added to payrolls in March, a steep miss from the 247,000 expected by analysts. The Federal Reserve is unlikely to raise interest rates for the first time in June, given the weak March payroll data combined with an expected deceleration in growth in the first three months of the year, economists said. The country created just 126,000 new jobs in March. This snaps a 12-month streak of gains surpassing 200,000. A light economic calendar will be in focus while the market digests Friday's unemployment report. Today, the U.S. final Institute for Supply Management nonmanufacturing data will be unveiled. Consensus analyst expectations anticipate no change in sector activity. On the international front, many markets are going to be closed today in Europe due to the Easter Monday holiday. The Ching Ming holiday will keep markets shuttered in China. However, Greece's debt will come back in focus this week, threatening regional stability in the European markets. The country owes 450 million euros ($494 million) on Thursday to the International Monetary Fund. However, the country has indicated its payments would be met. The Greek government is still anticipating approval for an extension from the European commission. Oil Prices Today: Oil prices were up this morning despite news the United States and Iran have announced the framework over Tehran's nuclear program. However, the U.S. government said the final agreement will not be reached until June. As it turns out, Tehran's nuclear agreement offers little chance for any significant boost to exports until 2016. That was exactly what our Dr. Kent Moors predicted one month ago when oil traders were convinced that Iran exports were going to lead to a collapse in oil prices. This morning, Brent oil jumped 2.1% to $56.10 per barrel. WTI crude added 2.0% to hit $50.13 per barrel. YNDX: Shares of competitor Yandex NV (Nasdaq: YNDX), a European Internet company and a search provider in Russia, were moving up this morning on news that Deutsche Bank AG (USA) (NYSE: DB) has raised its price target to $21 per share. In a research note, the investment bank said the company will benefit from the Russian antitrust investigation into the search practices of Google Inc. (Nasdaq: GOOG, GOOGL). HLF: Shares of Herbalife Ltd. (NYSE: HLF) were down more than 7% this morning on news that federal investigators are looking into the company's business practices, the latest chapter in the battle between the health marketing company and activist investor Bill Ackman. According to reports, Herbalife assisted its sellers with legal assistance, and it's under investigation for market manipulation and irregular trading. QURE: Shares of UniQure NV (Nasdaq: QURE) surged more than 57% in premarket hours on news that the gene therapy company is collaborating on a deal with Bristol-Myers Squibb (NYSE: BMY). In addition to the gene therapy deal targeting cardiovascular diseases, Bristol-Myers will acquire a 4.9% equity stake in the company. AET, HUM, UNH: Shares of the nation's largest publicly traded Medicare Advantage providers are in focus today ahead of a big pending decision by the Health and Human Services Agency's Center for Medicare and Medicaid Services. The agency will unveil its final rules for insurance companies on how the government will calculate Medicare Advantage reimbursements for their plans. The agency had announced previous guidelines in February that were favorable to insurance providers. However, any substantial changes could affect shares of Humana Inc. (NYSE: HUM), Aetna Inc. (NYSE: AET), and UnitedHealth Group Inc. (NYSE: UNH). SCHAY, AAPL: Electronics maker Sharp Corp. (OTC: SHCAY) is seeking assistance from the Japanese government-backed finance fund to aid a possible spinoff of its LCD division. The company has struggled for several years financially despite being an important supplier for Apple Inc. (Nasdaq: AAPL). Federal Reserve Bank of New York President William Dudley will speak about the national economy this morning before a group of local business and community leaders at 8:30 a.m.
Money Morning Tip of the Day: Every investor should have at least some exposure to emerging markets to benefit from the big returns they can offer. Emerging markets provide investors with some of the world's best growth opportunities. But they can be a tough sell for the risk averse. The MSCI Emerging Markets Index can skyrocket one year, only to be devastated the next. "At least limited exposure to emerging markets makes sense because they can offer explosive returns," Money Morning Resource Specialist Peter Krauth said. "That can apply to everyone, so long as the allocation is kept smaller for the more risk averse." Many investors buy shares in the iShares MSCI Emerging Markets Index ETF (NYSE Arca: EEM), which tracks the MSCI Emerging Markets Index. But this year, the Index is up 12.16%, while the ETF is only up 4.96%. A better strategy is to go with individual investments that have the best growth potential instead of an ETF with broad exposure. No. 1. Market Vectors Russia ETF (NYSE Arca: RSX): Many investors won't touch Russia right now. But its moments like these that actually make Russia a great place to put your money for stunning returns. RSX invests in countries incorporated in Russia that make 50% of their sales domestically. It has close to $2 billion in assets with a lot of exposure to the Russian energy markets. No. 2. Market Vectors India Small Cap Index ETF (NYSE Arca: SCIF): India has a lot of potential. And while SCIF is subject to intense volatility, it can come with big rewards. In 2014, it was up 64%. And the pro-business initiatives pursued by Prime Minister Narendra Modi will help this small-cap ETF grow even more. SCIF holds $266.6 million in assets, with a concentration on tech firms and the financial sector, including microfinance.